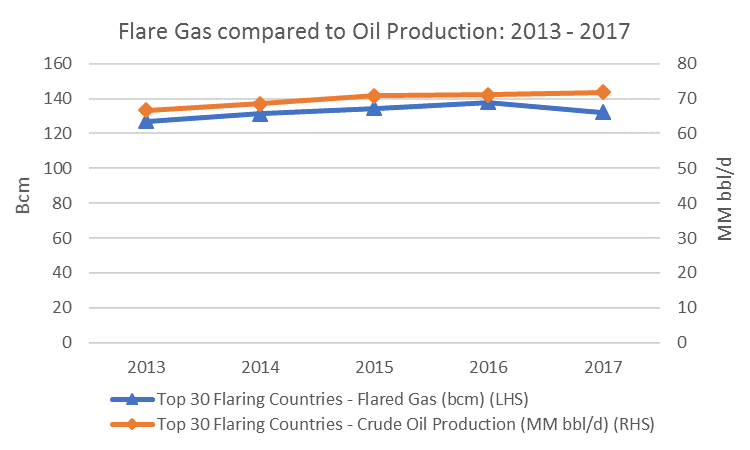 The World Bank Global Gas Flaring Reduction (GGFR) Partnership recently published its annual gas flare survey data for 2017, which encouragingly pointed to a 7.1 Bcm (~5%) year-on-year decrease in global flaring from 2016 to 2017. Whilst this decrease is encouraging for the World Bank’s parallel initiative of ‘Zero Routine Flaring by 2030’, the news is not all positive. 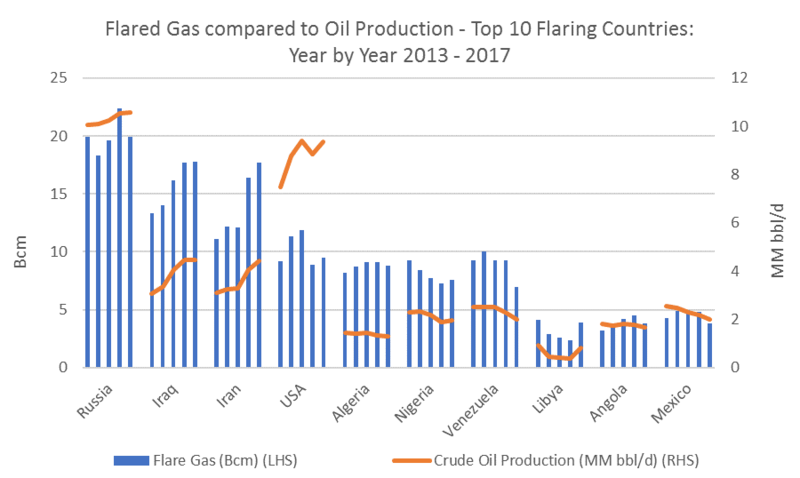 The data shows an increase of 1 Bcm in overall global flare volumes from 2013 to 2017 (5 Bcm increase for the top 30 flaring countries), and several major oil producers (including Iraq, Iran, US, Nigeria and Libya) actually increased flaring from 2016 to 2017. Second order priority: The production of oil drives revenues for producers and governments, and there is often a lack of economic incentive to commercialise flare gas – commercial producers are looking for commercial solutions. Without commercial solutions, it is only compliance with local policy preventing gas flaring to drive behaviour. However, it’s not all doom and gloom – there are interesting recent developments taking place in gas flare utilisation. The GGFR initiative, climate change and environmental commitments, technical developments and innovative commercial approaches are combining to move towards an objective of zero routine flaring. In Nigeria, the Federal Government has taken flare gas out of the hands of the upstream producers and launched the innovative Nigerian Gas Flare Commercialisation Programme, an initiative that sees flare gas made available to third parties through an auction process. Accompanying this, the Government has recently signed new flare gas regulations, providing the commercial structure for the auction process and introducing tougher new penalties with a view to achieving ‘flare-out’. The emergence of the shale gas revolution in North America has spurred technical advances, with a number of companies successfully developing small-scale modular LPG extraction units and mini-LNG applications. New small-scale Gas-to-Liquid (GTL) plants are increasingly demonstrating applicability in the flare gas space, with BgtL proving a 1 bpd concept in 2017 and GasTechno Energy and Fuels successfully operating a 0.4 MMscfd GTL over the last two years in North Dakota. These emerging technologies have the potential to complement the more well established small-scale power generation technologies, as well as traditional utilisation methods of pipeline, reinjection and fuel gas. While these commercial and technological solutions on their own are interesting, how they are deployed within a local area may be the key to successful implementation. The increasing emergence of embedded power generation, particularly in developing countries without existing or reliable grid infrastructure, may be a key enabler. In this case, established gas fired power generation technology can be utilised in a localised solution to reduce costs and, importantly, increase rural electrification and subsequent social benefits. Tanzania has been one of the world leaders in this regard, with over 100 ‘mini-grids’ in operation (over 150MW installed capacity compared to ~1500MW central grid capacity). Signs are encouraging for embedded power, however Governments must consider how they can make regulatory frameworks and permitting processes conducive to embedded power systems, and particularly private investment in these systems. So, as we look forward, what is the likelihood that we will achieve the World Bank sponsored target of zero routine flaring by 2030? If governments continue to be bold in supporting flare gas reduction and more broadly in setting up the frameworks for localised solutions to work, the technical solutions and the decarbonisation targets are there to make real inroads on the problem.